Giancarlo Stanton is one of the most dangerous hitters in baseball. But as good as he is, playing for the Miami Marlins hurt his overall hobby appeal. Now with the New York Yankees, his stage just got much, much bigger. 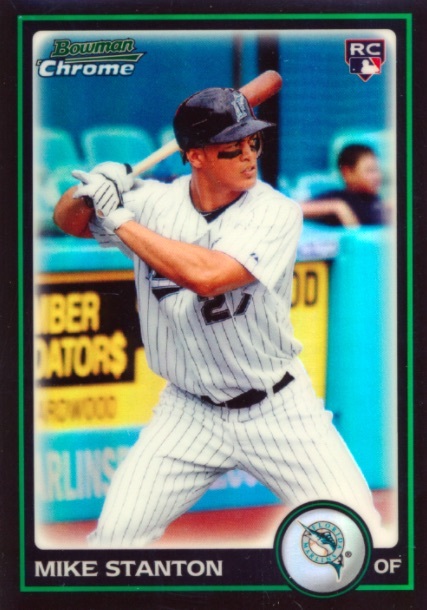 As a result, Giancarlo Stanton rookie cards are starting to get the attention they deserve. 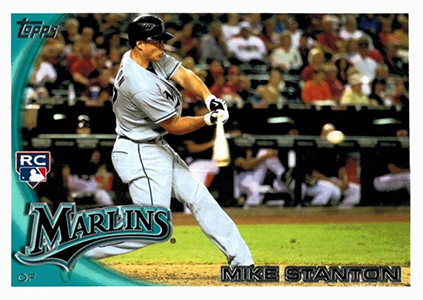 The first Giancarlo Stanton cards were issued in 2008 under the name he used to go by: Mike (or Michael). All of these came from prospect sets or were inserts, so they're technically not rookie cards. That said, it's unlikely you'll find a card of his that's more universally popular than the Michael Stanton 2008 Bowman Chrome Draft Prospect Autograph. 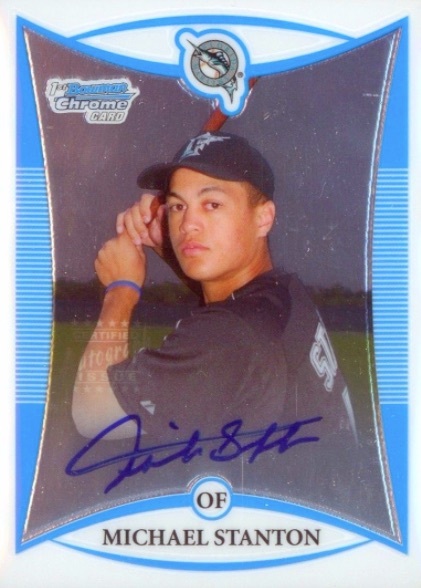 The official Giancarlo Stanton rookie cards released in 2010 following his debut with the Marlins. Most are affordable, although there are a couple of high-end options to chase. 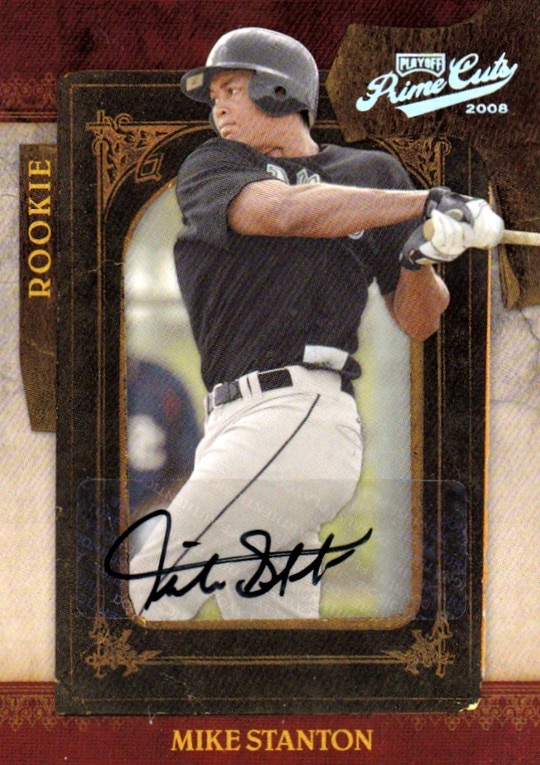 Stanton also appeared on several autographed inserts in 2010, which continue to see strong interest. Below is a full list of Stanton's rookie cards from 2010. Notable Giancarlo Stanton prospect cards are provided under the rookies. Click on the listings or images to buy singles on eBay. This is about as basic (and cheap) as it gets for Giancarlo Stanton rookie cards. Because of this, a lot of collectors opt for the more premium options like the Chrome version and various Refractors. 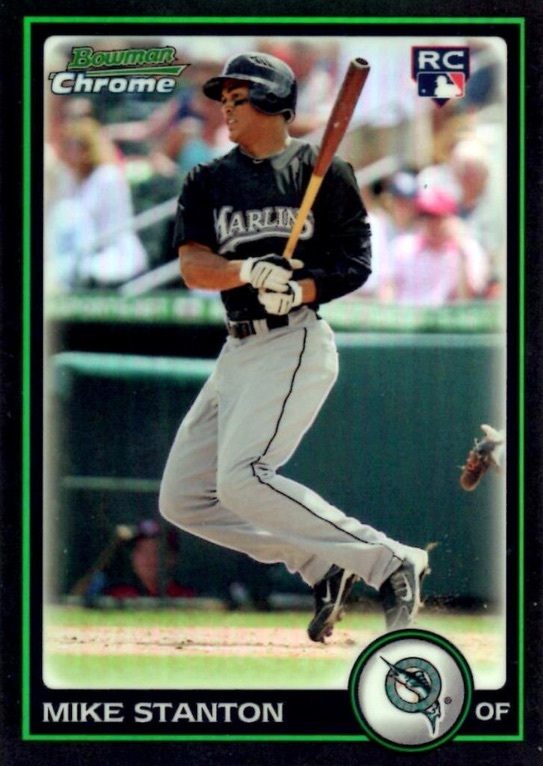 Although still a very budget-friendly card, Bowman Chrome offers a bit more of an upscale feel over the base Bowman Draft and Topps Update Giancarlo Stanton rookie cards. Collectors also have lots of Refractors to chase. Bowman Platinum is a brand that has evolved somewhat over the years. While it has always been about rookies and prospects, its early days were marked by dull foil. 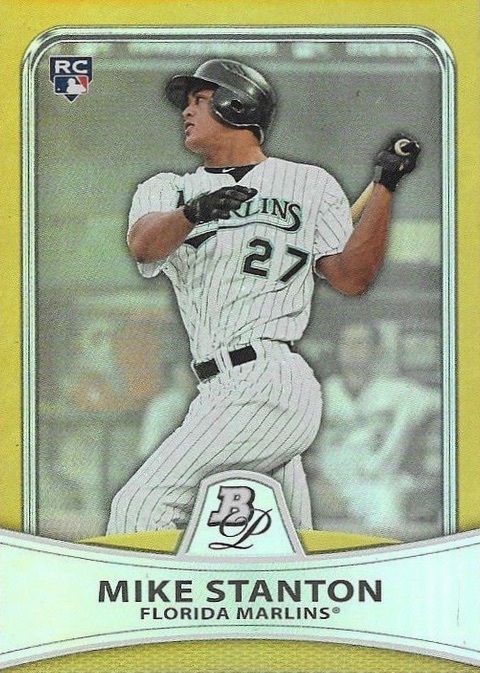 The 2010 Bowman Platinum Giancarlo Stanton is an example of this. However, the base Refractor (#/999) and Gold Refractor (#/539), pictured below, helps with that considerably. 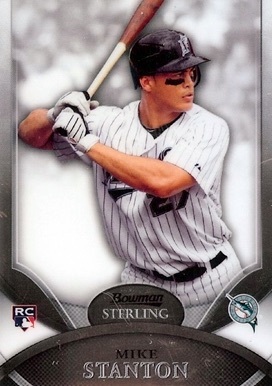 Although it's not numbered, the 2010 Bowman Sterling Stanton rookie card commands something of a premium. The reason? Base cards are tougher to come by in the autograph-heavy product. As a result, there aren't many of this card to go around, even with parallels that include Refractors (#/199), Gold Refractors (#/50), Black Refractors (#/25) and Purple Refractors (#/10). 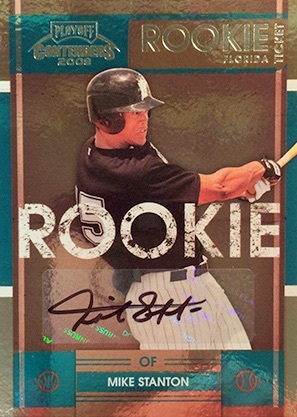 The 2010 Update Giancarlo Stanton rookie card has a couple of things going for it, but a high price tag isn't one of them. Boasting the flagship design, there's a good chance you'll see this card recycled over the years. Helping its appeal, the horizontal action shot is much more exciting than the photos on his other rookies. 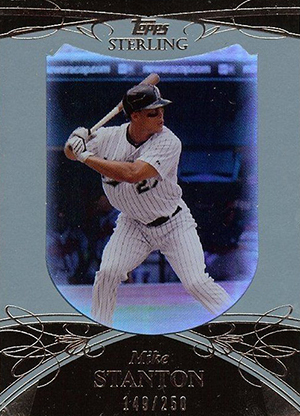 Another popular chromium option, collectors can find a base rookie and an autographed version for Stanton. It's good to note that 2010 Topps Chrome is notorious for curling, so other than a top loader, storage might be a little trickier. Of course, in modern Topps Chrome fashion, there are also many Refractor parallels. Rarity is the driving force behind Stanton's Topps Sterling card. Coming from a high-end set, it's one of only two serial numbered Giancarlo Stanton rookie cards. Limited to 250 copies, they don't show up in large numbers and command something of a premium that's similar to Bowman Sterling. 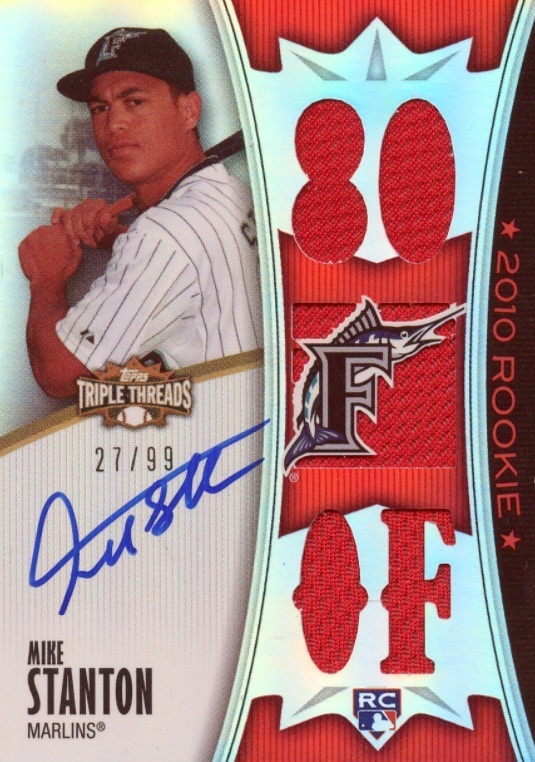 Although Giancarlo Stanton has several autographs from 2010, Triple Threads is the only one that's a true base set rookie card. Not only signed on-card, it also has three memorabilia swatches and is numbered to just 99 copies. The following is a list of key cards that came out before Stanton's MLB debut. They're either from prospect-only sets or are numbered outside of the primary base set. 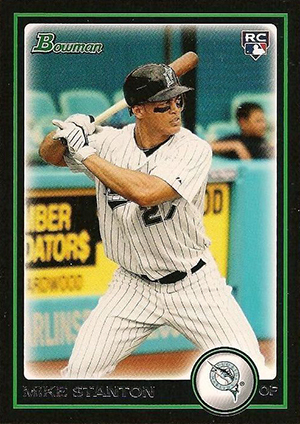 If you're looking for the top Giancarlo Stanton card, this is the one that most will choose. Bowman Chrome autographs have become the cornerstone of the prospect market. Signed on-card, base versions sell for hundreds. 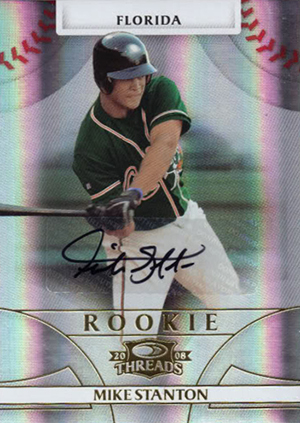 There are also Refractor versions that are numbered and can go for much higher. An alternative to Topps MLB products, Donruss/Playoff produced several prospect sets with early Giancarlo Stanton cards. The Turn of the Century card in 2008 Donruss Elite Extra Edition is numbered to 100 and also signed. Even without the Marlins uniform, the card still moves at strong prices due to its rarity. Unsigned versions are also an option at much lower values. Done with the same foil stock as Elite Extra Edition, the 2008 Donruss Threads Giancarlo Stanton autograph is much more plentiful and affordable. In all honesty, it's probably best for those who are looking for an early autograph more than an attractive card. As many know, the Contenders brand carries more weight in football than in baseball. 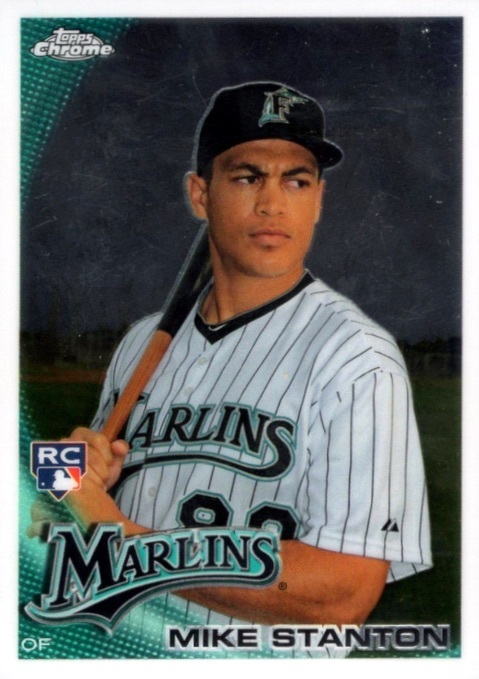 Although the 2008 Playoff Contenders Giancarlo Stanton card sports the Rookie Ticket name, it doesn't look much like a ticket. However, the low print run of 149 is a nice selling point. There are also unsigned versions if you are wanting something less expensive. The Prime Cuts Giancarlo Stanton card has an ornate look that is disrupted somewhat by the sticker autograph. Again, the low print run, this time to 249, is the most appealing aspect. If the post is regarding Gioncarlo, why is most of the stuff for Mike? Eric M � Michael is his middle name, which he went by at first. He switched back to a preference for Giancarlo. I personally own a 2008 Playoff Contenders auto, but it is stamped on the front Black box Authentic and is numbered on back 3/3. Significance? Obviously much later than the 149 print run. Have any others surfaced that you are aware of? Correction to previous message ” obviously much better than the 149 print run” . Unless his Bowman Chrome Superfractor auto emerges, I believe my Black box edition #’d out of 3 is Giancarlo rarest Auto Rookie to date. Thoughts? Comments? Since it’s the Black Box edition, that means it was probably leftover stock and not part of the original print run. This can be an important distinction for some collectors. As for rarity, it is likely the rarest parallel that is not 1/1. It certainly has good value but is unlikely to come close to any of the low-numbered Bowman Chrome parallels (especially Gold #/50 or Red #/5, let alone the Super) unless it has a Gem Mint grade. Trey – Are we assuming that it was overstock or could it possibly be one of the original 149 and reissued (sort of like Topps does with Archives) with the impression and 3/3 numbering on the back? Overstock tags a negative aspect to this card and even though Donruss or Panini at that point in time released a 149 count on the non numbered original version, if there was overstock would that number of 149 produced not hold true? Just trying to dig deep and get as much information on this card as possible. Thank you for your expertise and responses. Appreciated. Most likely the card is from leftover replacements or redemptions that were never redeemed. I would think it less likely they re-numbered one from the main release but anything is possible. Only Panini can give you an answer about the specifics. Thanks again Trey. Yes Panini confirmed it was made from overstock. All of the black box products where they saved some of the best patches, plates, autos etc. And did not put them into product purposely to gift to “people of the industry” pretty sad if you think about it that those nicer versions could have been packaged into packs and found by who should matter the most, the consumers. Anyways all this has shed a lot of light on this card. 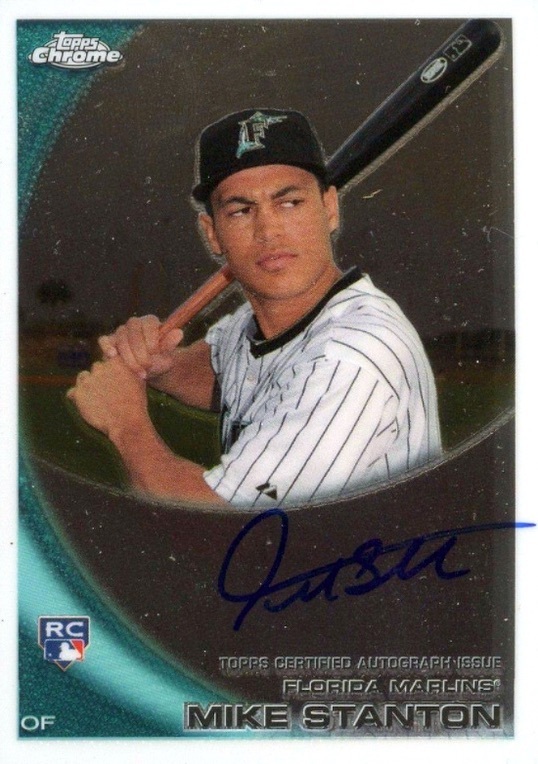 I agree it should be in the caliber of the 2008 Bowman chrome autos maybe around a blue or xfractor version. But who knows the value isn’t always important I am just proud to own it. I appreciate the time and responses.